The Hyannis Holiday Motel is family owned and operated. The Hyannis Holiday overlooks Hyannis harbor and is across from the Nantucket and Martha's Vineyard island ferry boats. Located in the "Hyannis Main Street and Waterfront District". Our guests can walk to restaurants, beaches, boats, shops, attractions, and to downtown Hyannis the homeport of Cape Cod. Overlooking Hyannis harbor, we're central to all of Cape Cod's attractions. 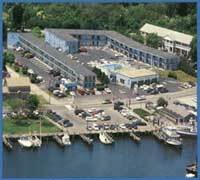 So if your looking for lodging accommodations on Cape Cod such as hotel, motel, cottages, inn, resorts or bed & breakfasts, please consider the Hyannis Holiday Motel for your lodging accommodations. We look forward to being your host.